Robin M. Giblin-Davis’ research focuses on determining the control potential of different cultural, biological and chemical strategies for the management of nematode populations in turfgrasses and ornamental plants. With support from the United States Golf Association, Giblin-Davis has discovered three new species of bacteria that appear to be effective in controlling nematodes in the golf course environment. 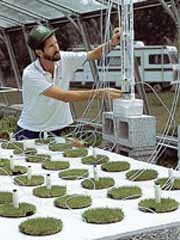 He also has led a UF research group that is working closely with the U.S. Department of Agriculture on developing biological controls for weeds that threaten the Florida Everglades, including the Melaleuca tree and the waterhyacinth. As a result of this work, the first biological control for Melaleuca, a weevil from Australia, was released in Florida. Much of Giblin-Davis’ research focuses on understanding pheromones present in some species of weevils that can be used to control nematode transmission and develop safe, effective traps for detecting the movement of the weevils and their associated nematodes from Central and South America into Florida.